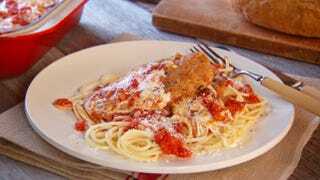 SACRAMENTO—As part of its effort to provide the most comprehensive reporting possible on the seminal dish, Oppositelock announced Wednesday the debut of a new premium blog that will offer continuous, around-the-clock updates on Chicken Parm. “Included with Jalopnik Gold, you’ll have an all-access pass to the Parm Farm, which features wall-to-wall coverage of every variety of the dish, as well as in-depth analysis of consistency, seasoning, and recipies we’re able to dig up from classified recipies,” said Oppositelock spokesperson Brian, adding that the new blog will include uninterrupted live footage of a chicken parm in a test kitchen, along with nonstop commentary from a 12-person panel of culinary experts. “We know our viewers will come to depend on this outlet for 24-hour coverage of chicken parm, which is why the cheese, breast, and sauce updates will appear in a ticker at the bottom of the screen. We’re particularly excited for the premiere of the a weekly feature, Chicken Parm Food Truck Racing.” Minutes after Parm Farm went public, sources confirmed its engagement had already surpassed those of Oppositelock.